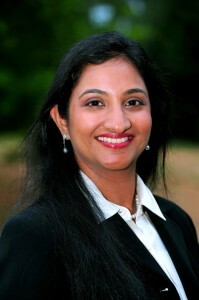 Dr. Pushpa Sundareswaran lives in Alpharetta, GA with her husband and two children. She has been practicing children’s dentistry in Atlanta for 11 years. She received her dental degree from University of Pennsylvania in 2002. Dr. Pushpa has a special interest in infant oral health and focuses on prevention as a key aspect of pediatric oral health. She believes in establishing a dental home for the child and the parent or caregiver. Dr. Pushpa and her family enjoy traveling and exploring new places. Her personal interests include gardening with her children and classical dance . Conducted oral health screenings at health fairs in the Atlanta community. Completed community service while in University of Pennsylvania, School of Dental Medicine. Organized school based community dental health programs in Bombay, India.